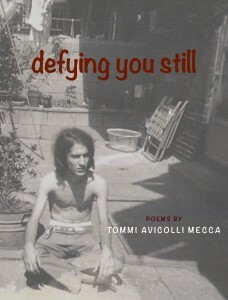 Tommi Avicolli Mecca | original writings, music and poetry. I have that posted above my desk in my room. It’s a principle I live by. Always has been. At least since I was 16 and announced at Thanksgiving dinner that I didn’t believe in god anymore. My Roman Catholic Italian family didn’t blink. They kept on eating Mama’s homemade lasagna. They were used to me saying outrageous things. Mama had decided early on that I was well-named. “Doubting Tommaso,” she called me, mixing English and Italian. The nickname was a reference to the apostle who didn’t believe that Jesus had risen from the dead. The priest in religion class wasn’t as understanding when I expressed my doubts. He had me stay after school for the rest of the year, to sweep floors and scrape gum from the bottom of desk tops. As if that was going to make me stop wondering how Catholics could believe in three gods, yet still be monotheistic. “It’s a mystery of the faith, you’ll understand it when you die,” just didn’t cut it for me anymore. Writing was my salvation. Mama had an old Underwood typewriter in her bedroom. I’d stand on a small stool to reach the top of the bureau it sat on. She wouldn’t let me take it into my room, even though she never used it. 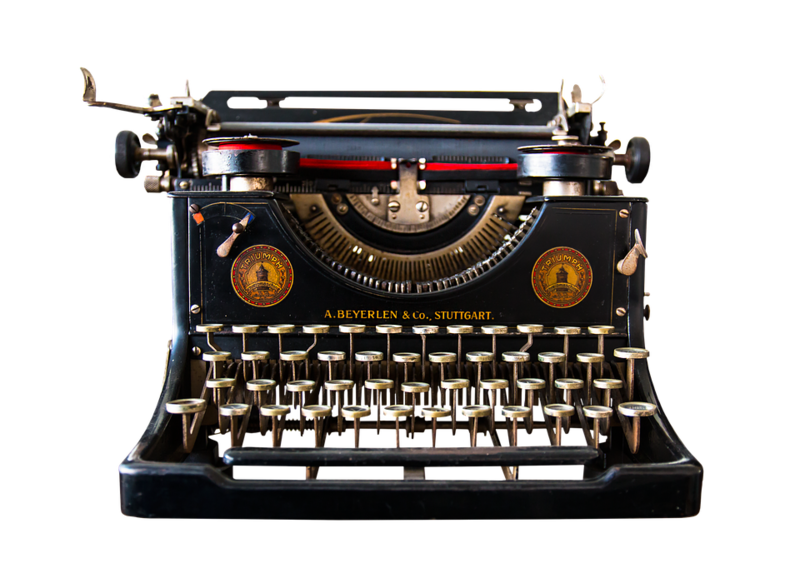 For hours, I’d tap away on that primitive keyboard, churning out page after page that I hid under my tee-shirts in my drawer or carried with me in my back pack. There was nothing I couldn’t express on those secret pieces of paper. Even my most hidden feelings. Like how I lusted after the Sicilian boy with the black hair and olive skin who lived two blocks away. If anyone ever found them, I’d say I was writing from the perspective of a woman. Writers did things like that. My first poems were published in the neighborhood newspaper, the South Philly Review and Chronicle. Nobody understood them. I kept the words vague to hide my true feelings. 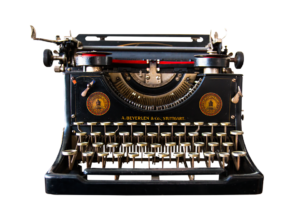 The editor encouraged me to keep writing. My father didn’t react well to my pronouncement at dinner one night that I was going to be a writer. “You’re gonna waste your life!” he yelled before he stormed out of the room. Eventually he came to accept what I wanted to be. Sort of. “Do whatever you want. Just don’t write nothing about this family or I’ll beat the crap outa ya.” He wasn’t kidding. I felt suddenly very isolated. My brother helped me understand that ostracism was a time-honored tradition among writers. So was rebelliousness. He gave me a copy of a play he had just finished. No Exit changed my life. I read everything by Jean-Paul Sartre I could find. I spent countless hours in the library and in the narrow aisles of an old bookstore, soaking up some of the greatest thinking of the 20th century. Not to mention breathing in dust that Walt Whitman had probably dragged in a century before. As my hair grew longer and my outlook on life became more radical, I found my way to antiwar marches and eventually gay liberation meetings. For years, I carried Allen Ginsberg’s Howl in my back pack along with the Communist Manifesto. I quoted Jean Genet and James Baldwin to guys who picked me up when I hitch-hiked to and from college, even though some of them were more interested in something other than literary matters. The first public reading of my work came after I won the Temple University “Young Poets” contest in 1971. I had just come out of the closet. Fired up with a new-found spirit of defiance, I walked up to the mic and introduced the first poem, mentioning that it was written for a guy I had been in love with. No one, myself included, breathed until I finished. All content is © 2015 and can only be reprinted with permission. Email tommi@avicollimecca.com. Pictured above is: (left) Benito Santiago, (center) Lupe Arreola and (right) Tommi Avicolli Mecca performing at a Plaza 16 event in the Mission, San Francisco. To download my poetry collection free on any Apple device (not sure about a PC), go to the iBooks store, search for my name and you'll see it: a collection of poems from 1971-2015, most of them published in various journals. 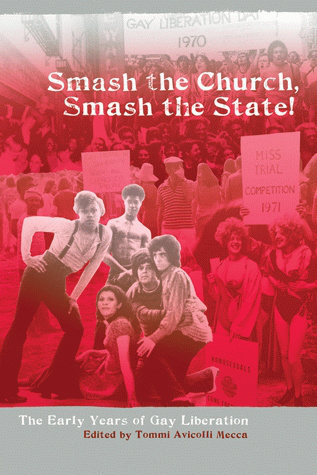 An anthology about the 70s gay liberation movement that I edited for the 40th anniversary of the Stonewall Riots. You can order it from City Lights Books by clicking on the book cover above. I use “i” in Tommi, it’s androgynous and in Italiano there’s no “y.” Avicolli is Papa’s name, it could have something to do with ancestors or birds, but could also be from the old Latin “aviculus” which means a small bird. Mecca is Mama’s name. It’s Spanish or Moorish, but her family’s also from southern Italia.